It's a surprise to no one that the most common conversations in aviation, center on people and planes. And why not... it makes for great hangar flying. This week, Al and Marc were reminded of another very important aspect of aviation... The Airport. We're not talking about the runways, but how the airport serves as a hub for bringing people and planes together. Airports have personalities that are born out of the stories and the people who make them happen. This week, the SimpleFlight crew visited a shining example of the perfection that happens when it all comes together. Poplar Grove Airport (C77) is a very special place. It's not because of chance, but rather the owners of the airport, Steve and Tina Thomas, designed it that way. They built a culture years ago, which they protect, strengthen, and live 7 x 24 x 365. After a tour of the field, which was too short for their liking, the guys had a chance to sit down with Steve and Tina and talk about how they make the magic happen. When you listen to this week's show, you may hear about a flight school, a maintenance shop, a museum, and an air-park, but what you'll feel and think about is the history, the passion, and a very special community. You can read about Poplar Grove on their website:(www.poplargroveairmotive.com), but ​if you ever in the Midwest, drop by C77 and say hi to Steve and Tina (and the dogs). You may never want to leave. Ask a pilot, which is their favorite plane, and they may answer with a plane they've never flown before. We know that sometimes an airplane "speaks" to a person. It may be the history, the sound, the performance, or maybe it's because of it's lines and appearance. LIN 2010, Cirrus continued its streak of innovations by introducing the Xi appearance option. It gave owners the option of making their plane a truly personal "one of a kind" experience. Chris Custer, Lead Xi Designer for Cirrus Aircraft, joins the SimpleFlight crew in this week's episode to discuss the program from the designer's point of view. This includes the challenge of working with an owner to help them vocalize and translate their vision into a reality that takes the ownership experience to a higher level. Chris' passion for design, combined with the pride he takes in helping customers navigate the many decisions they must make, comes through with "flying colors" in the discussion. We hope you enjoy Chris' story as much as Marc and Al did. As President of the Leading Edge Flying Club in Chicago, Marc meets a lot of "avgeeks"; each with a story that connects them to our special aviation family. Recently Marc met Nathan Dial, an Air Force Captain who moved to Chicago on a 3 year sabbatical to earn his PhD. Prior to coming to Chicago, Nate was flying C-130's as a Flight Commander of Group Current Operations, 55th Electronic Combat Squadron, Davis-Monthan Air Force Base, in Tucson. His resume of accomplishments and decorations is lengthy, and especially impressive, considering it's all happened in less than 10 years. Not surprisingly, Nate's success has been the result of his intelligence, hard work, and understanding that the successful completion of every flight is based on how well the crew works as a team, and not due to any single crew member. We know you will enjoy getting to know Nate. Let us know if you have any other questions you'd like us to ask him. It feels like ADS-B is almost about ready to get started. We only have one year left before the FAA mandate in 2020 for ADS-B Compliance! Did you know that ADS-B has been an old idea built up of multiple technologies? Steve Bussolari was one of the original thought leaders and key contributor of building out the ADS-B system. He has so many stories to share from his time developing this new network while working in the MIT labs. We take it for granted the amount of weather information, traffic information and resources available in our flying. Imagine in the early 1990's having an LCD screen in a Cessna 172 displaying traffic through an ADS-B device. You look out the window at 12 o'clock and 3 miles there is traffic in the exact spot that is displayed on the screen - you would probably be really excited! Here is to a great start of 2019!! Congratulations to our Avgeek shout out!! This week our shout out goes to all the professional ATC controllers! Hopefully things will return to normal for all of you working in all the air traffic facilities! This past week, Marc found himself at his airplane at 6AM in anticipation of a 7AM departure for some minor maintenance at an airport some two hours away. The only issue was his home airport (KPWK) was fogged in with forward and vertical visibility near zero. When it became apparent the fog would not lift, he canceled. He posted the situation on Facebook and Instagram, @simpleflightradio, kicking off a diverse set of opinions. Please note, Al, Marc, and Joby are participating in many holiday events over the next three weeks, so we're going to hold off posting any shows until January 7th. In the meantime, visit our web page (simpleflight.net/podcast) to take a trip down memory lane and re-listen to some of your favorite shows from the past 7 years. Wishing all of you a wonderful holiday season and a Happy and Healthy New Year! Congratulations to our Avgeek of the Week! 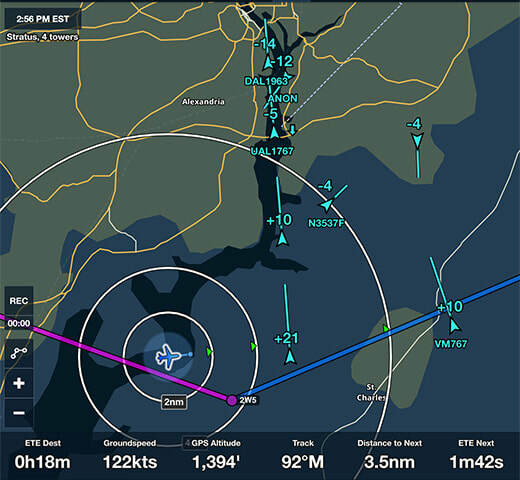 This week's "Avgeek of the Week, correctly answered our Instagram post asking for the three criteria necessary to land coming out of an instrument approach. @wcrahen correctly identified that you must, be in a continuous position to land (stabilized approach), have the required visibility, and have some element of the runway environment in sight. Great job and ties nicely to this week's discussion. This week, Al confesses to some troubles in the cockpit, that ultimately point to an enemy of a pilot .... Complacency! Marc and Al take the conversation to a deeper level and come to the conclusion, that the very things pilots strive for as part of a safety culture, including process, standardization, and a rigid acceptance of checklists, can contribute to routines that may detract from the quality of a flight and potentially, its safety. This week, Marc and Al had some special guests that made their way to the SimpleFlight studio at KPWK. Gavin Black, Andrew Haefner, Pierce Lane, and Bill Engelking flew from their respective home bases in Knoxville and Duluth for the show. That, in and of itself, epitomizes what flying clubs are all about. It's all about adding a social aspect to our flying and infusing some energy into the aviation experience. What's different about their flying club, is that they are part of the Cirrus Employees Flying Club. While they enjoy unique benefits associated with a club sponsored by an aircraft manufacturer, the value they receive is in many respects, common across all flying clubs. It's an interesting mix of differences and commonalities. @stephenrunkel correctly answered our Instagram post asking for the requirements associated with oxygen usage in the cockpit of our general aviation planes. Stephen knew that FAR 91.211 requires the PIC to use oxygen after 30 minutes at 12,500 feet, use it continuously at 14,000 feet, and offer it to passengers at 15,000 feet. Not regulatory, but it's also recommended that oxygen is used at 5,000 feet for night operations. This is due to the improvement in night vision when oxygen is used. This week, we speak with Bob Schmelzer, who has spent the last 40+ years, flying for United Airlines. Just this past week, Bob turned 65, which by FAA rules, required him to retire from the airlines. With 27,000 of his 37,000 hours being at United, it is certainly an end to an era. The good news for GA is that Bob has never stopped training primary and advanced students working towards a rating, and even evaluating pilots while acting as a FAA designated pilot examiner. He stands as a role model for giving back to aviation! Listen in and join the SimpleFlight crew in learning about Bob's experience leading up to his last airliner flight, then feel his emotion as he describes that last flight, and finally what lies ahead for him. @BMP590 correctly answered our Instagram post asking for someone to identify what famous hangar was pictured. Our Avgeek of the week knew that the picture was none other than Red Bull's Hangar-7 at Salzburg Airport. It is a unique building which houses the historical Flying Bulls aircraft fleet and a collection of Formula 1 race cars. Hangar-7 also offers space for art exhibitions. And with its Restaurant Ikarus, two bars, an Outdoor Lounge and one café, it is not just an events location, but a meeting point for art lovers and bons vivants, too. This week's show features Jason Schappert of MzeroA.com. As pilots around the world know, Jason Schappert is a CFII and ATP rated pilot. He is the founder of MzeroA.com, and author of eight aviation flight training books. In 2008, Jason was named AOPA's Top Collegiate Flight Instructor, which was followed by being named an Outstanding Flight Instructor in both 2014 and 2015. Having amassed over 8000 hours of in-flight instruction since learning how to fly, he now provides help to many through his Online Ground School at mzeroa.com. What you will learn from Jason is how his values, business acumen, and focus on helping to create safer pilots translate to success! You're going to love this episode!!! Tips for getting the engine warmed prior to start. Required items for the cockpit. What's wrong with a 50 foot extension cord. @waddlebus correctly answered our Instagram post asking for what TKS stands for. @waddlebus knew that the popular de-icing fluid's name came from the three companies that invented the fluid during WWII. That being Tecalemit - Killfrost - Sheepbridge. Their formula lowers the freezing point of water and has helped to provide greater utility for aircraft around the world.